The LMMI's celebration of the 110th anniversary of Anne of Green Gables concludes with Damaris Abreu's response to "Chapter XXXVIII: The Bend in the Road." Thank you all for joining us as we re-read such a beloved novel together. This is a reflection, as if from the very Lake of Shining Waters. 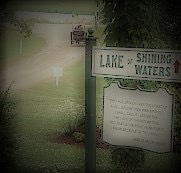 A place where I've only visited through Kevin Sullivan's movie of Anne of Green Gables and finding inspiration from a blog photograph by Kat showing "the bend in the road" as a carriage nears the lake Anne loved so much. I had listened to an audio reading by Lorraine Montgomery of "Chapter XXXVIII: The Bend in the Road." It was a funny happy sad experience to revisit Anne and Marilla, as they tried to make sense of such an affecting change of life. Accepting the reality of illness that would soon cripple Marilla's eyesight and mourning the loss of their beloved Matthew, all while trying to decide what commitments they valued most and why. Ever since I first saw Anne of Green Gables, as a single teacher, I identified so well with the dream filled limitless character of Anne. No goal was unreachable. Her ideas swam as freely in her mind as rays of sunlight dancing over waves of her shining waters. Though self-doubt often tried to haze her ability to envision success in excelling in her studies, or accepting her own reflection in the mirror, she always found a way to identify with her innate drive to see the worth in her creative abilities. She would resolve to accept the outcome of any undertaking, as long as she knew she gave it her all. In this, Anne found profound satisfaction. For me, Anne was my manic self. Before I had treatment, there seemed to be nothing I couldn't do. Procrastinating, though negative, would often give me the edge I needed to finish some creative projects, until unrealistic goals made it so I couldn't anymore. I was usually less inhibited to engage in creativity to write poetry, paint canvases or take photographs. My marriage and children helped brought awareness of distorted thought patterns that I could no longer ignore. A diagnosis of bipolar disorder, coupled with years of medication adjustments and varied forms of counseling carried me through many peaks and valleys throughout my journey between relapse and recovery. But like Anne, who somehow always seemed surprised each time she found she had excelled in her final exams or success in reciting poetry, I'm learning that, though I gravitate towards being alone, there is healing in being surrounded by kindred friends and family. They always deposit words of encouragement and support through prayers at unimagined moments in my life. So in the midst of Marilla and Anne's "depths of despair" Rachel Lynde elates them with the relieving news that Gilbert Blythe had given up the school in Avonlea for Anne Shirley and had decided to take the school in Carmody, instead. Anne's relationship with Gilbert then emerges into a flourishing friendship as they exchange the rare gifts of gratitude for his kindness, and her forgiveness for his ever great trespass of calling her "carrots". Gilbert, a young man who in his heart had always been by her side, though kept at an undesirable distance, joyfully declared: "We are going to be the best of friends...You’ve thwarted destiny enough. I know we [will] help each other in many ways." Over a week ago, I was blessed with a similar gift at a marriage retreat. Just as Anne was finally able to break the reservation she held against Gilbert Blythe, which enabled her to see him for the real, trustworthy friend who only had her best interest in mind, I was able to see my husband as the long lost friend I had all along. I believe the Lord unbandaged layers of old pain from my heart to help me stop working against him and decide to work with him towards a better future together. Anne finally saw past her "highfalutin [I now know is a real word, thanks to blogger James MacMillan] mumbo jumbo" image of who her bosom friend, and accepted Gilbert as he was. As my husband and I faced each other in a meditative embrace, we both knew then and there at that retreat that our renewed commitment would break away with the past memories of what we thought was each of our greatest past trespass(es). We decided that together we'd be better equipped to face whatever obstacles and challenges presented itself against our family around the bend in the road of life. I’ve only just begun the fight of working hard work towards learning Anne's style of developing an impenetrable optimistic outlook on life. New thought processes have been forming through workshops I've been taking along with my fellow WITsters (Women in Transition Sisters). We’re encouraged to select words of affirmations, which I link with scripture verses for myself. The idea is to combat self-sabotaging thoughts and exchange them for positive words we actually believe, which will transform our lives. We'll see positive behaviors towards lasting change and goal reaching. I feel as if I've joined Anne, through my being a WITster and having renewed my vows with my husband, in sharing a path towards developing "the joy of sincere work, worthy aspiration and congenial friendship", which is all a dream in the making. Damaris Abreu is a Hispanic American, married for twenty years with two teenagers and a tween. She has taught reading and ESL to children for over 11 years. Damaris is also a creative non-fiction writer and an artist experimenting with inspirational collage art, mixed media and altered book journals.